This morning, we had a meeting of the 2000s vs. the 1980s. This afternoon for our final first round game, we have the same! The entire run of the 2011 Cardinals, from the Colby Rasmus trade to the run that started in late August to the David Freese Game is well chronicled and is so familiar to everyone that was around at the time. I don’t want to say that our favorite (by seed) in this matchup is overlooked, because I don’t think that is the case. I’m just not sure it really gets its fair due, because it is probably the best pitched game I’ve ever seen. I know you remember the game, but we’ll give some background just in case. After the Cardinals had been able to win Game 4 (which was remarkable in and of itself, given that Roy Oswalt started it for the Phillies), they went into Philadelphia knowing that their best was on the mound. The problem was, the Phillies’ best was on the mound as well and there weren’t many better than Roy Halladay. As was mentioned many a time during the series, Carpenter and Halladay were friends from their time in the Toronto organization. They had a vacation planned together after the 2011 playoffs, one that they kept even after this head-to-head battle. Halladay had a 19-6 record and a 2.35 ERA for the season, was an All-Star and was runner-up for the Cy Young award that he’d won the year before. Honestly, if you’d told anyone that night that Halladay would retire after two miserable years in 2013, nobody would have really believed you. There seemed to be plenty in the tank. Carpenter, on the other hand, hadn’t been to that level but was still his normal outstanding self, putting up a 11-9 record and a 3.45 ERA. He also would be out of baseball after one more year, a year plagued with injuries that in part came from his willing of his body through this playoff run. That was to come, though. If there was anyone a Cardinal fan wanted to see on the mound, it was Carpenter. You know the old saying–if you are going to get to an ace, get to them early. Rafael Furcal led off the game by tripling on Halladay’s fourth pitch. Five pitches later, Skip Schumaker drove him in with a sacrifice fly. John Rooney likes to tell the story that Mike Shannon leaned over to him after the inning and said, “It’s going to take more than one run to win this game.” For once, the Moonman was wrong. Carpenter was amazing. He went the distance and allowed just three hits throughout the whole game. While the game was a tightrope all night long, Carp never slipped. Fans were holding their breath throughout the whole thing, and I remember pacing the same bit of carpet, standing inches from my TV and sharing my tension on Twitter, but Carpenter was at the peak of his powers. He had to be. After getting Schumaker, Halladay allowed only five more hits over the eight innings and struck out seven while walking one. Ryan Madson struck out two of the three he faced in the ninth, which was big for the Phils because they had Chase Utley, Hunter Pence, and Ryan Howard due up. Utley scared everyone by sending a shot to the wall, but Carpenter got the next two to ground out. The last one was devastating for Howard, who tore his Achilles on the play and never really was quite the same. The primal scream Carpenter let out still reverberates through Cardinal history. You could watch just the ninth and get a feel for it, but why not revisit more highlights? This game goes up against the only entry in the tournament that doesn’t have a definite date. There’s no one time that we saw Ozzie Smith do the backflip, which is why the word “iconic”–a word I find way overused and misused–fits so well here. 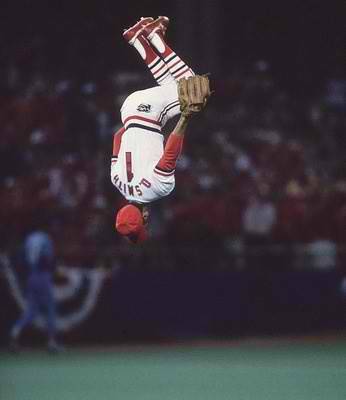 Who doesn’t think of the Cardinals and think of an inverted Ozzie, that 1 blazoned on his back, in the middle of a flip? It’s one of those pictures that immediately screams St. Louis baseball. It defined an era as well as the Hall of Famer that performed it. Look at that. Still flipping at 40. At that age I have trouble flipping off the light switch. I think the flip, while great to see in action, stands out most as a still image in most people’s minds. A picture like the one below probably graced a number of bedrooms and sports rooms across Missouri and the surrounding states, if not the entire country, during the late ’80s. So what wins here? A legendary performance or a timeless representation?